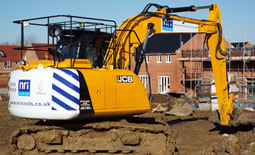 NRI Civils is a Groundworks & Civil Engineering Contractor specialising in adoptable infrastructure and associated building services on a number of domestic and commercial contracts ranging from £250k to £20 million. Based in Great Oakley, Northants and with access to major link roads we are able to successfully cover an extensive geographical area, including Northants, Bucks, Beds, Cambridgeshire, Rutland, Lincs, Derbyshire, Notts, Leicestershire and Warwickshire. With the needs of an ever changing industry we feel our modern approach to quality assurance, efficient and image puts us ahead of our competitors. Our highly experience management are forward thinking and committed to achieving contracts to programme with the upmost quality and understanding our clients requirements to achieve their ‘shop window’ to maximise sales. Supported by our continuously evolving H&S and training programmes our clients benefit from a fully polished service. 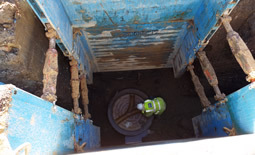 NRI Civils can deliver on a wide range of Civils and Groundwork’s projects. We also work closely with the client to offer valued engineering. Schemes include working in restricted conditions and to tight programmes.